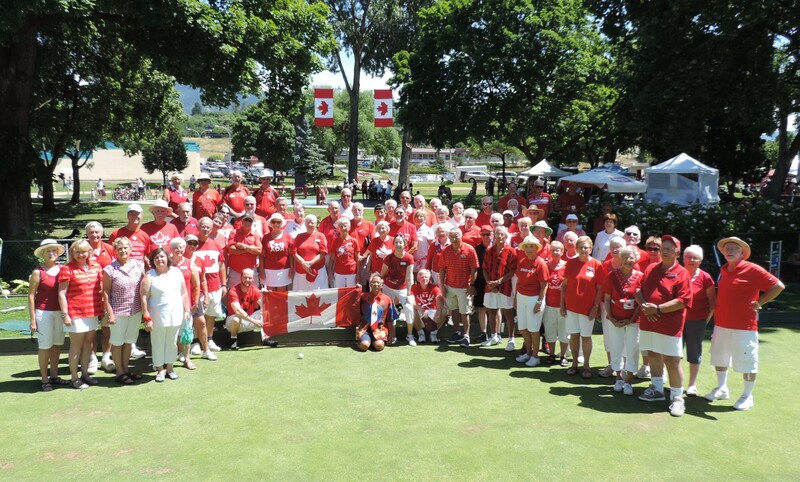 The Vernon LBC was host to it’s 19th Annual, Funtastic Mixed Triples Lawn Bowling Tournament this past weekend, June 30th, July 1st & 2nd, 2017. Twenty teams from throughout the Interior Division of Bowls BC entered the event. A total of $1,500.00 was up for Prize Money, essentially turning over the 20 Teams’ entry fee of $75.00 per team back in prize money. It was a lovely weekend, under sunny warm Okanagan skies. There were a number of new bowlers who entered the event this year, making it their first, and good chance, not their last tournament they will enter! The focus of the tournament is to have “FUN”, but as has been stated in the past the competition is quite keen. A tradition of this event is to have everyone dress up in our National Colors on Canada Day! I must say it is quite the sight to see 60+ bowlers and guests put on their finest against the Canadian Flag backdrop the city sets up in beautiful Polson Park. I am hoping the group picture I have provided you is available to download. I have also taken the liberty of enclosing the names of the Winners and Runners Up in the five flight divisions. Congratulations to all the bowlers. It was truly another “Fun-tastic” event! If anyone is interested in participating in this event next year, please check out our club website,http://www.vernonlawnbowlingclub.com/ for further details as they become available,. once again to be held over the Canada Day weekend, June 29th – July 2nd.